Sophia was diagnosed with stage III myeloma, which is a type of blood cancer. She was working as a teacher in an engineering college. The diagnosis came as a shock for her. She needed a stem cell transplant to produce blood in her body and also some other components for her immune system to work. Her own stem cells were recovered and harvested in a system. These cells were then put back into her body intravenously. After a 3-weeks hospital stay, she returned to her home to face a new set of challenges. 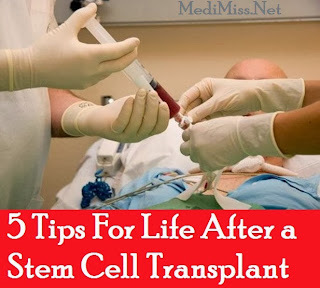 Here are 5 tips that she shared with me to recover from the transplant. Ignorance is bliss, but it can be pretty dangerous for you if you have just returned home after a transplant. There is no substitute for staying updated about the post-transplant care. Get help for readying your home. Nothing could be better than a disinfected, and clutter-free home. Let your family and friends take up the task of dusting, organizing, laundry, and vacuuming. And you enjoy the break from the household work! Infection is a major concern for the patient. Sophia had to limit face to face interactions with her family and friends for 2-3 weeks. During this period, they would wear masks and gloves. However, you can always talk and laugh with your near and dear ones using Skype and other video chatting technologies. Sophia had to wait for about 30 days before her first public outing. Managing 3 small children can be a tough job. So, Sophia would take a nap in the afternoon before her 3 school going kids would come back. This would energize and prepare her for the late afternoon and early evening rush. Her husband would take over the household tasks once he arrived from his office. After the bone marrow transplant, you may feel as weak a new born baby. And you'll have to start all over again. Sophia started walking in her small garden the first few days, and then went on increasing distance and time outside. She gradually but continuously built up her strength. Sophia could be around her kids as long as they were not sick. Kids too didn't mind wearing masks and gloves during the first few weeks. Safety was the top-most priority, at least during the first 100 days after transplant. So when the kids would jump off their school bus and reach home, hand wash and cloth changing were the first requirement. Sophia is pretty well these days. And she always takes out time to pray, love, and be loved. The message that Sophia gives is clear: there is life after stem cell or bone marrow transplant. Don't give up if you have been diagnosed with cancer. Bone marrow transplant /stem cell transplant is a life-saving procedure, and with the tips shared above you can recover quickly after the transplant. Don't give up. Live your life to the fullest.